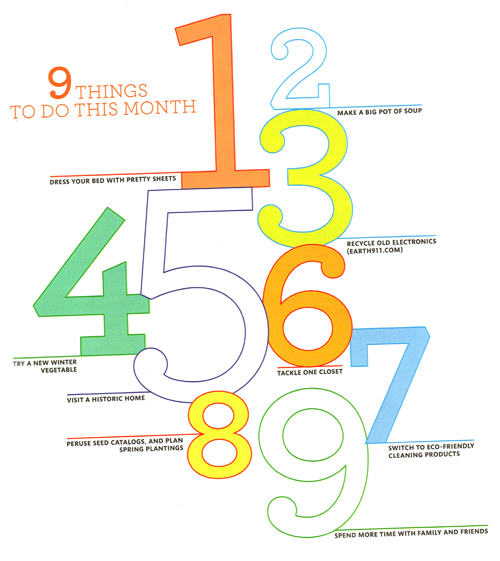 In the January issue of Martha Stewart there was a list of 9 things to do in January. I wanted to do as many as I could. Here is how it went. 1. Dress your bed with pretty sheets - I put our flannel sheets on the bed. They have sledding penguins on them. That's pretty right? 2. Make a big pot of soup - Aaron made a cold cucumber mint soup for detox, but I don't think that is what they meant. 3. Recycle old electronics - I meant to recycle my mom's old computer but I left it at their house. 4. Try a new winter vegetable - We tried a lot of new veggies on detox - is Swiss Chard a winter veggie? 5. Visit a historic home - well we moved into a house built in 1900. Does that count? 6. Take one closet - I totally did this! I organized our downstairs coat closet and my upstairs clothes closet. 7. Switch to eco-friendly cleaning products - we already used eco-friendly products so we didn't have to make a switch. I do want to try the new Method laundry detergent though. 8. Peruse seed catalogues and plan spring plantings - we looked through my grandma's seed catalogues, I think we are going to try beets this year. 9. Spend more time with family and friends - definitely tried to do this. Ok so I was a little off on some but I gave it the old college try.